Splashy Adventure is a fast arcade game in which you collect coins and have to avoid attackers. There are two islands and the cute little fish has to swim in between them and collect treasures near the boat bridges. That sounds easy, right? It certainly would be if it weren't for the predatory fishes that are out to get you. With a single click or tap you can change the direction in which the fish is going and use this to avoid any contact with fishes of prey. If you swim right into them you will not only lose the game but also the cute little fish will get eaten. 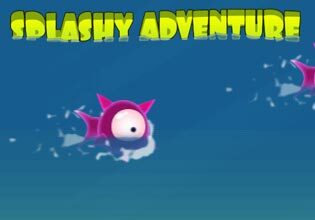 Play Splashy Adventure now for free and try to escape as long as possible!